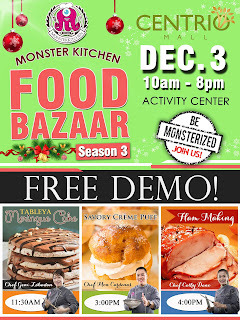 Yes mga higala, on its 3rd year, Monster Kitchen brings back one of Cagayan de Oro's biggers food event of the season, The Monster Kitchen Food Bazaar. 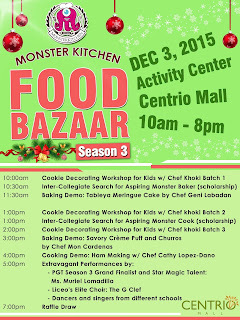 This years food bazaar have more stalls from different Monsterprenuers. These monsterprenuers exhibitors are those who gained certificates in Diploma Courses or Lifestyle Courses or both. Who knows, you might find the right monsterpreuer to cater for you wedding or other life treasured event. While you are there, buy some raffle tickets for a chance to win an electric oven that can jump start your baking skills. Besides for the yummy goodies that being exhibited, they will also give baking and cooking demos for us to gain more knowledge and confidence in the kitchen. Personally, I am very interested to learn how to make ham which will be demonstrated by Chef Cathy Dano at around 4pm. For more sweetness for the upcoming noche buena and media noche Chef Geni Labadan and Chef Mon Cardenas will demonstrate how to make Meringue Cake and Cream Puff (respectively). 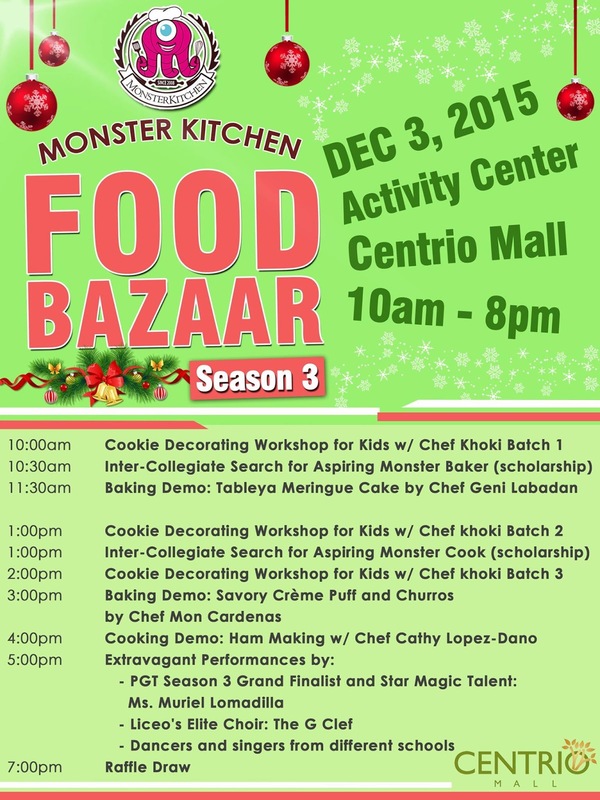 For the kids, Chef Khoki Saavendra will have 3 batches of Cookie Decorating Workshop making this bazaar perfect for barkada and families. 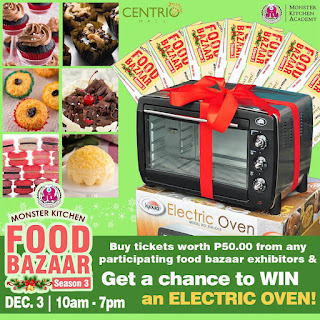 See you on December 3 mga higala, dont forget, Centrio Activity Center whole day today until 8pm.